It has just been brought to my attention that I missed an anniversary yesterday (28 February). On 28 February 1784, William Pitt the Younger received the Freedom of the City of London at a banquet held at Grocer’s Hall. This was towards the end of the so-called “constitutional crisis” triggered by George III’s dismissal of the Portland ministry and appointment of 24-year-old Pitt at the head of a minority government. Assisted by a combination of behind-the-scenes bribery, eloquence in Parliament, his reputation for purity, and downright luck, Pitt had been slowly gathering public support and chipping away the opposition’s majority throughout February. The Freedom of the City was a great coup for him, since the City traditionally held itself independent of the monarch and had a great deal of political influence. 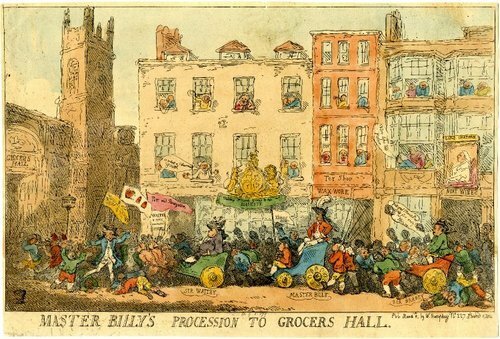 Pitt’s carriage was drawn from Berkeley Square, where he was living with his brother, to Grocer’s Hall by his supporters. The Populace insisted on taking off the Horses and drawing the Coach. A Mob is never very discreet, and unfortunately they stopped opposite Carlton House and begun [sic] hissing, and it was with some difficulty we forced them to go on. As we proceeded up St James’s Street, there was a great Cry, and an attempt made to turn the Carriage up St James’s Place to Mr Fox’s house (he then lived at Ld Northingtons) in order to break his windows and force him to light, but which we at last succeeded in preventing their doing. I have often thought this was a trap laid for us, for had we got up, there, into a Cul de Sac, Mr Pitts situation would have been critical indeed. 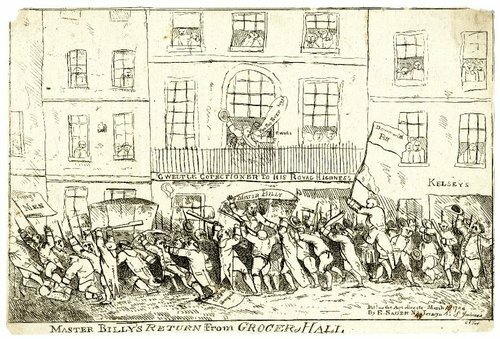 This attempt brought us rather nearer in contact with Brooks, and the moment we got opposite (the Mob calling for lights) a sudden and desperate attack was made upon the Carriage in which, were Mr Pitt, Lord M[ahon] and myself, by a body of Chairmen armed with bludgeons, broken Chair Poles &c (many of the waiters, and several of the Gentlemen among them). They succeeded in making their way to the Carriage, and forced open the door. Several desperate blows were aimed at Mr Pitt, and I recollect endeavouring to cover him, as well as I cou’d, in his getting out of the Carriage. Fortunately however, by the exertions of those who remained with us, and by ye timely assistance of a Party of Chairmen and many Gentlemen from Whites, who saw his danger, we were extricated, from a most unpleasant situation, and with considerable difficulty, got into some of the adjacent houses, without material injury, and from there to Whites. The Coachman, and the Servants were much bruised, and the Carriage nearly demolished. I do not recollect having particularly seen Genl Fitzpatrick, but I distinguished Mr Hare, and the present Lord Crewe extremely active, and I think Lord Robert Spencer, standing at the Door. I remember when the Streets were a little clear, I walked over, with Mr McDowall to Brooks, and went up into ye Club Room, but the Party were either gone home, or gone to Supper. The next morning I met Lord Ossory in St James’s Street, who attempted to make apologies for what had passed, and to lay it upon ye violence of the Chairmen, some of the Chairs having been broken by the Mob. I never went to Brooks any more, and I was never able to ascertain further what passed or what first led to the Outrage that night.